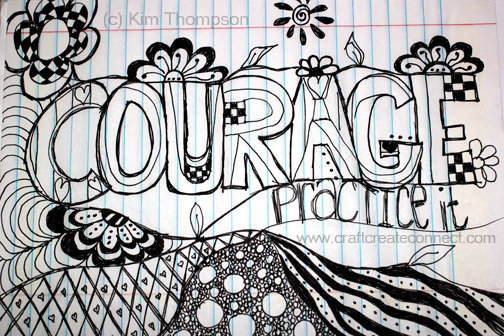 The word COURAGE has been resonating in my head lately.And the word FEAR keeps popping up in my blog reader feed. I guess it’s something we all face daily isn’t it. FEAR. Fear of finances, fear of failure and perhaps even fear of success try to hold us back. 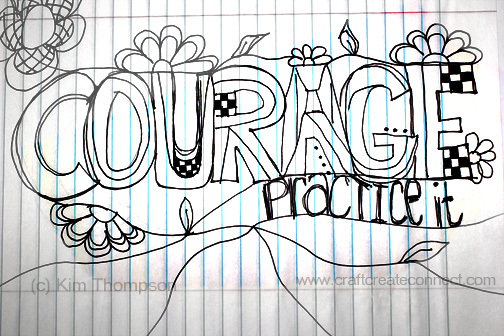 What I have chosen to do, instead of facing my fears… is PRACTICE COURAGE. Fear feels like this ominous outside “thing” that is hard to control, hard to see, hard to predict. Courage, however, comes only from within. It is something we all have, that starts in our heads and in our hearts. It feels like something we have control over. Something we can muster. Something we can call on. So each day, I work on practicing courage. For this art journal page, I used bright colors, which may not seem courageous to you, but are outside my typical comfort zone. I also practiced my doodles and lettering… both of which I fear showing the world… yet here they are! 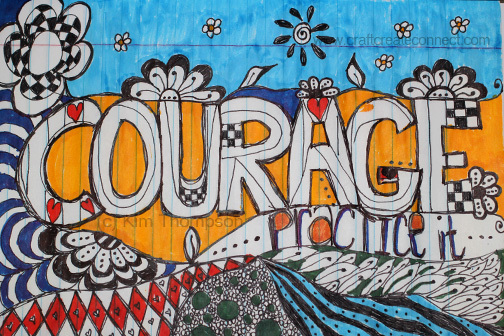 What are you doing today to practice courage? I know you can! I LOVE the stuff that Julie does. I am taking a class right now with Megan Suarez King… and have taken classes with Christy Tomlinson and Junelle Jacoben as well in case you want to go looking :). Good luck and have fun!